This Occupational Health and Safety Assessment Series (OHSAS) Standard and the accompanying OHSAS 18002, Guidelines for the implementation of OHSAS 18001, have been developed in response to customer demand for a recognizable occupational health and safety management system standard against which their management systems can be assessed and certified. 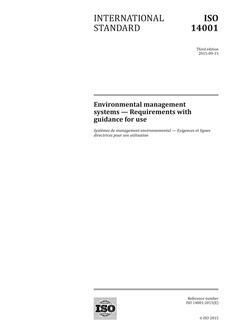 OHSAS 18001 has been developed to be compatible with the ISO 9001:2000 (Quality) and ISO 14001:2004 (Environmental) management systems standards, in order to facilitate the integration of quality, environmental and occupational health and safety management systems by organizations, should they wish to do so. This OHSAS Standard will be reviewed or amended when considered appropriate. Reviews will be conducted when new editions of either ISO 9001 or ISO 14001 are published, to ensure continuing compatibility. 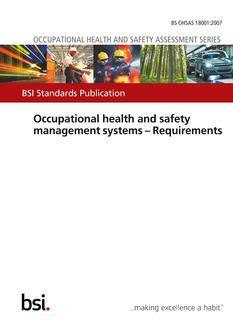 This OHSAS Standard will be withdrawn on publication of its contents in, or as, an International Standard. This OHSAS Standard has been drafted in accordance with the rules given in the ISO/IEC Directives, Part 2. This second edition cancels and replaces the first edition (OHSAS 18001:1999), which has been technically revised. The principal changes with respect to the previous edition are as follows. - The importance of "health" has now been given greater emphasis. - OHSAS 18001 now refers to itself as a standard, not a specification, or document, as in the earlier edition. This reflects the increasing adoption of OHSAS 18001 as the basis for national standards on occupational health and safety management systems. - The "Plan-Do-Check-Act" model diagram is only given in the Introduction, in its entirety, and not also as sectional diagrams at the start of each major clause. - Reference publications in Clause 2 have been limited to purely international documents. - New definitions have been added, and existing definitions revised. - Significant improvement in alignment with ISO 14001:2004 throughout the standard, and improved compatibility with ISO 9001:2000. - The term "tolerable risk" has been replaced by the term "acceptable risk" (see 3.1). - The term "accident" is now included in the term "incident" (see 3.9). - The definition of the term "hazard" no longer refers to "damage to property or damage to the workplace environment" (see 3.6). It is now considered that such "damage" is not directly related to occupational health and safety management, which is the purpose of this OHSAS Standard, and that it is included in the field of asset management. Instead, the risk of such "damage" having an effect on occupational health and safety should be identified through the organization's risk assessment process, and be controlled through the application of appropriate risk controls. - Sub-clauses 4.3.3 and 4.3.4 have been merged, in line with ISO 14001:2004. - A new requirement has been introduced for the consideration of the hierarchy of controls as part of OH&S planning (see 4.3.1). - Management of change is now more explicitly addressed (see 4.3.1 and 4.4.6). - A new clause on the "Evaluation of compliance" (see 4.5.2) has been introduced. - New requirements have been introduced for participation and consultation (see 4.4.3.2). - New requirements have been introduced for the investigation of incidents (see 4.5.3.1). This publication does not purport to include all necessary provisions of a contract. Users are responsible for its correct application. Compliance with this Occupational Health and Safety Assessment Series (OHSAS) Standard cannot confer immunity from legal obligations. 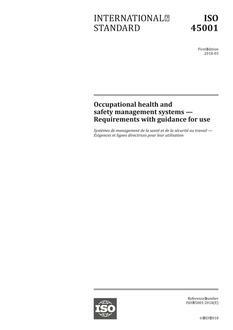 a) establish an OH&S management system to eliminate or minimize risks to personnel and other interested parties who could be exposed to OH&S hazards associated with its activities; b) implement, maintain and continually improve an OH&S management system; c) assure itself of its conformity with its stated OH&S policy; d) demonstrate conformity with this OHSAS Standard by: 1) making a self-determination and self-declaration, or 2) seeking confirmation of its conformance by parties having an interest in the organization, such as customers, or 3) seeking confirmation of its self-declaration by a party external to the organization, or 4) seeking certification/registration of its OH&S management system by an external organization.